In July, Reece – our Creative Director – and I attended the Jobs to be Done Workshop by Jillian Wells, as part of our training scheme. Jillian is a Senior Product Researcher at Intercom, with experience in user research, industrial design, and technology. She focuses on a human-centred approach when creating a new product or service. This is what lead her to Jobs to be Done framework. If I’m honest, I only had a basic understanding of the theory, so I really wasn’t sure what to expect. But straight away Jillian explained that user stories can fall short because they make too many assumptions. It helps to create a simplified description of a requirement, however, leading queries can add in prejudges, stereotypes and personal experience, rather than relying purely on the data. This made sense to me! After all, we’re ‘creating’ a person, so naturally we can’t help but pour some of ourselves into that persona. 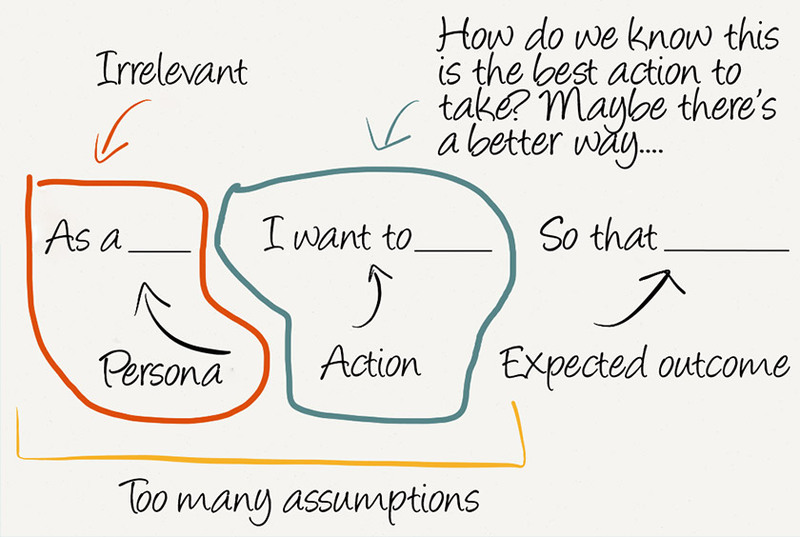 So for now, let’s forget about user stories and dive into job stories! The first exercise of the workshop was to choose a product and write a switch interview to test on each other. 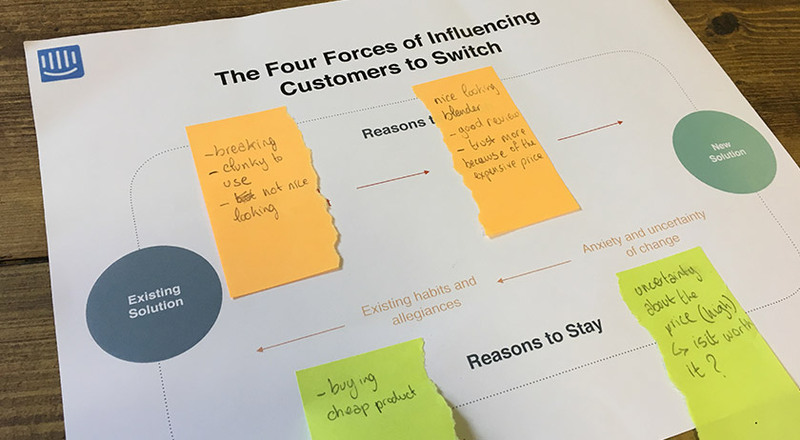 A switch interview focuses on the story of how a user stopped using one product and started using another: the first step to finding a job story for a product. A job story encourages the product’s design process to focus on context, causality and the user’s motivations. JTBD says that people buy things in order to help them when they’re struggling to make progress. The aim is to focus on the moment someone decides that this is no longer a struggle they want to have and that they need to switch to a new solution. We all wrote down a product we’d recently bought, and teamed up with the person next to us to start the interviews. I found that even the questions that didn’t initially seem that useful were actually the ones that triggered the memory best. How frequently do you shop? When did you first realise you needed something to solve a problem? Did you ask anyone else about what they thought about the purchase you were about to make? Before you purchased, did you imagine what using the product would be like? Where were you when you were thinking this? Finding out about emotions is important here, and can take a while to master. I was investigating a man’s purchase of a blender, and I was very surprised by just how many details about the product came from the interview, as well as his emotions and feelings about his buyer journey. It mainly taught me to dig for details without inputting my own thoughts and opinions. I found out the man I was interviewing liked to have a quick smoothie before going to work or going for a run. The previous blender he had was a cheaper model that was clunky to use and eventually broke a few times. This was the struggle that led to his switch to a new – more expensive – product. The questions revealed that the design of the new blender was really important to him, which even he only realised at the end of our conversation. As he was prepared to spend more money on the new product, it had to go with his open kitchen. However, he was anxious about the price and requested the advice of both friends and internet reviews. This will help to see what the user really wants from a product. This speedily highlights what the user’s problem is, so we can meet the expected outcome. So this is an example how the blender job stories went. Overall the course was a great first step into the Jobs to be Done world, but there’s still much to learn. Absorbing an entirely new theory and system was a touch overwhelming on the day, but looking back at my notes, Jillian’s presentation and further reading are becoming ever clearer. And the best bit is I’m already implementing Jobs to be Done. Interviewing users on their product requirements turned out to be helpful back at the office. When taking my colleague through a new website we had produced, I was far more comfortable asking questions and getting details about how they were feeling throughout the journey. I needed feedback on the homepage and booking journey of a travel site, so I gave my user a scenario to complete, while speaking their thoughts out loud, allowing me to follow their thought process. I used the JTBD training to concentrate on their emotions, which gave me insight into what they understood the site was offering, their assumptions, and disappointments. In the long run, and with a little more training, Jobs to be Done is definitely a technique that would benefit addmustard. If you want to learn more about JTBD techniques, have a look at those resources.